Do you like the look of paper flowers, but are not sure how to make them? 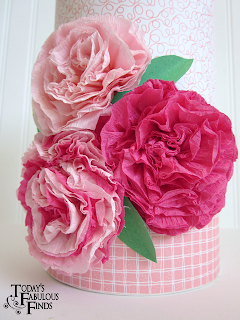 I just came across a super simple tutorial on how to make pretty paper flowers out of CREPE PAPER STREAMERS. The possiblities of what you could do with these flowers is endless. Use them to embellish a present, or for party decor, make a teacher gift and so much more. To see how to make this pretty flowers, check out the blog Today's Fabulous Finds here.